Saudade is a deep emotional state of nostalgic or profound melancholic longing for an absent something or someone that one loves. Portuguese is a language known for its intrinsic musicality. When you listen to a person speaking Portuguese, you feel like you are listening to a song. Sounds, speed variations, and pauses make a unique rhythm that is easily recognizable even if you don’t speak this language. In addition, I think some Portuguese words can transmit emotions just by the way they sound. Saudade is one of them. I thought about saudade a few months ago, when I attended a public talk on emigration. In Italy, this is a growing phenomenon, especially among young people unable to find a job. Several of my compatriots who emigrated attended the talk and each one described briefly their experience. Inevitably, missing their own country—i.e. saudade—was one of the most discussed topics. In this regard, what impressed me the most was the impact of modern communication tools such as Skype, Facebook, Whatsapp, etc. Commonly, we think that the availability of these powerful apps “make the world a smaller place.” They should make it less painful to live far away from family and friends. Unexpectedly, I found out not only that this is false, but also that these tools make the distance even more hurtful. The speakers used the “umbilical cord” analogy to explain this concept and made a comparison with the emigration waves of the first half of the last century. Then, there was nothing comparable to modern communication means. This obstacle to regular communication resulted in this “cord” being cut through sharply and quickly. It also forced the emigrants to focus on building a new life in the host country. Today, emigrants are constantly in touch with their families and friends, making impossible to forget what they left behind and leading in a nostalgic feeling that is hard to overcome. This event also made me think of what is known as “working nomadism,” a phenomenon which is growing especially in tech-related jobs. Most Italian emigrants leave my country for job-related reasons. Luckily, all the emigrants who talked during the discussion found a satisfying and steady job in the country where they had moved to. Not all are so lucky, however. Some have to change jobs frequently or even move from one country to the other. Italian mass media often stress the fact that uncertainty—along with poor pensions—will be a common trait of many jobs in the future. Put differently, odds are that it will become harder and harder to get a job for life because of the frequent and disruptive changes caused by technological progress. On the other hand, I wonder what kind of society we will be able to build if most people live a persistently insecure employment situation. How can you make plans two or three years in advance if you don’t even know in which country you will celebrate next Christmas? And, more importantly, what kind of bond would you establish with the community in which you live, if you knew you were likely to leave in a few months? In such a hypothetical society, individuals would lose any sense of belonging. They would be very weak politically, a situation that well-organized minority groups could exploit to gain power. Last but not least, the most powerful topic that emerged during the discussion was identity, a word that comes up inevitably when talking about leaving your homeland and confronting different cultures. For most of the emigrants whose move to another country is unsuccessful, this is why they give up and return to their motherland. They can’t handle the impact of such a drastic change in their life and they end up feeling disoriented and lost. One of the speakers—Matteo Rampin, who is the brother of my good friend Marco—provided a captivating explanation of this effect. According to him, this feeling is due to the lack of a strong identity. To illustrate his point, he drew a contrast to the multi-ethnic ancient Venetian society, which I described in this post. Rampin claimed that Venetian society thrived, despite deep differences in terms of customs and habits, religions, and cultures, because ancient Venetians had a strong identity. They knew who they were and what their role in the world was. 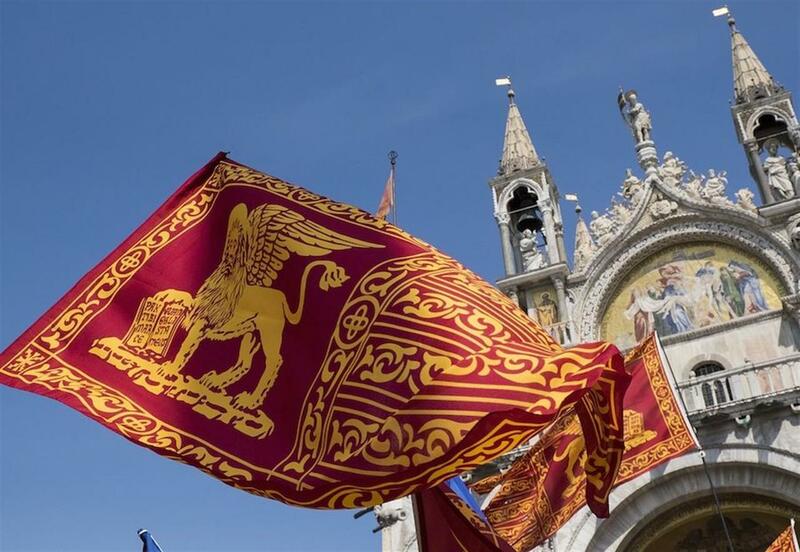 Their culture was so rooted that even today there are several political movements and cultural associations that fight for the creation of an autonomous state in Venice and the surrounding area—this phenomenon is referred to as Venetism. According to Rampin’s interpretation, this profound self-awareness allowed Venetians to manage a deeply heterogeneous society because they didn’t fear the stranger at all. In other words, they were not afraid that other cultures could erode theirs, or destroy their identity. I think that this captivating, alternative angle on the multiethnic composition of the ancient Venetian society does not conflict with what I wrote previously. Rampin presents a more general concept that embraces the sophisticated Venetian legal system that I discussed there, which is another fundamental part of their identity. What is outside is inside too; and what is not inside is not anywhere. That’s why there’s no need to travel. If you have nothing inside, you’ll never find anything outside. It is useless to go look around the world looking for what you can’t find within yourself. Examples of how this feeling is alive can be seen in several houses in North-East Italy that exhibit proudly a waving flag of the Republic of Venice. But these homes’ owners would never do the same with an Italian flag. They remind me of houses in the South of the US that display a Confederate flag. Featured image: photo by Ishan Gupta on Unsplash.